Dhaanish Ahmed College of Engineering, Chennai in THE HINDU newspaper has advertised for recruitment of Professor / Associate Professor / Assistant Professor Plus Non-Faculty jobs vacancies. Interested and eligible job aspirants are requested to apply immediately from 03rd April 2019. Check out further more details below. Candidates should have good conceptual knowledge. Candidates should possess good communication skills. Responsible to guide and oversee the instructional, co-curricular and extra-curricular programs. 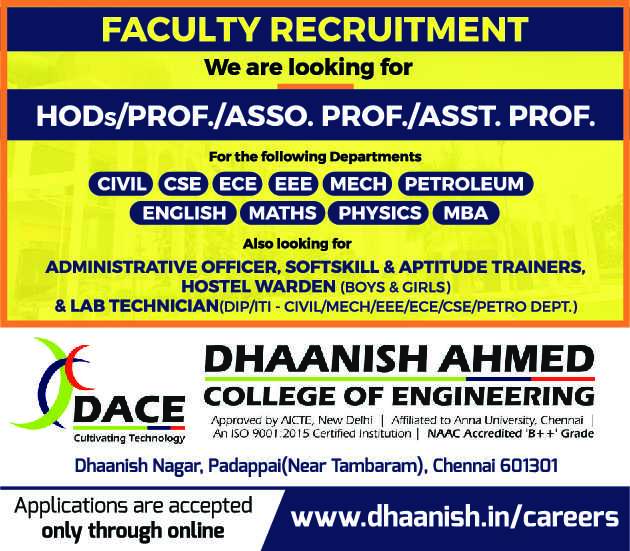 How to Apply: Interested and eligible candidates are requested to apply ONLINE at the the college web address provided below.